If any of you are familiar with the Quentin Tarantino classic ‘Pulp Fiction’ and have your finger on the pulse when it comes to references, then you’ll know that Big Kahuna is the name of the burger joint those chaps go to before Sam Jackson shoots them. Unfortunately, this play video slots game is not about that, but about the true meaning of the word Big Kahuna. Big Kahuna is a Hawaiian Shaman, and this is what this games about. 5 reels of tropical paradise with the assistance of the kooky shaman and his game board filled with grinning monkeys and watermelons. Deposit and spin today on this Hawaiian online slot game and earn yourself some significant cash prizes and free spin bonuses. Ever wondered where the online casino era started? We know all about it and we can say that you are in good hands with this one, as Big Kahuna slots game was designed by one of the pioneers in online casino gaming. Microgaming was the first company that introduced the online casino and gave us the opportunity to play gambling games without leaving the house. 20 years have passed and now Microgaming online casinos take their well-deserved place among the most popular online casinos in the world. You can discover online casino slot games created by Microgaming today. Join the relaxing atmosphere on the shores of Hawaii and win amazing prizes, as the sorcerer of this beautiful island will reward you big time for finding all the wonders of Hawaii in this 5 reels, 9 paylines online slots game from Microgaming. Enjoy the stunning waves of bonuses as you play best online video slots today! This title is whoopingly packed with Wilds, Scatters and bonus rounds, as you are so about to have a red hot time on the Hawaiian beaches, winning more than you can ever count. Being carefully designed, this game has a crisp, clear, yet detailed overall appearance, all of this being conceived based on a Hawaiian theme, with plenty of fruits and masks from the local culture on the reels. When it comes to gameplay, it is so intuitive that taming this volcano and walking away with red hot Big Kahuna wins becomes a piece of cake. First of all, just pick how many of them paylines you’d like to play on, then set your bet by using the coin button, all of this for you to be able to finally spin them reels and get yourself on the right path winning. If the atmosphere really got you like relaxing on a Hawaiian beach, you can at anytime take advantage of the Auto-Play feature that lets the computer spin for you, as you sit back and watch your pockets being filled. Apart from all this, Big Kahuna also rewards you with great bonuses. The Wild in this game is represented by Big Kahuna himself, and it will substitute for any other fruit symbol, creating winning combos whenever multiple wild symbols appear in a row in an active combination. The scatter in this one is the cheeeeky Monkey symbol that will complete a winning scatter combination, if you are lucky enough to get 2 or more of them funky monkeys landing on your spinning reels. The wins provided by the scatter are calculated by multiplying the Scatter symbol combo payout, times the overall number of bet stake. That is not all, as there is also a mini-game available with this one, that is called Pick A Mask, and is triggered by getting at least 3 Mask symbols on an active payline. Doing so can bring you up to 4,375 coins by unveiling the right mask, picking from 10 Tiki masks present in the minigame. The heart of the island is the showdown. The Volcano bonus awaits you! Land yourself on 3 or more Volcano symbols and you will trigger this bonus that can bring you up to 2,500 coins. You can do so by simply choosing 1 out of 5 fruit offerings to reveal a random bonus prize and the win will be multiplied by your total bet stake. No wonder the Hawaiians have no worries when you see what a fortune you can make when Big Kahuna is on your side. 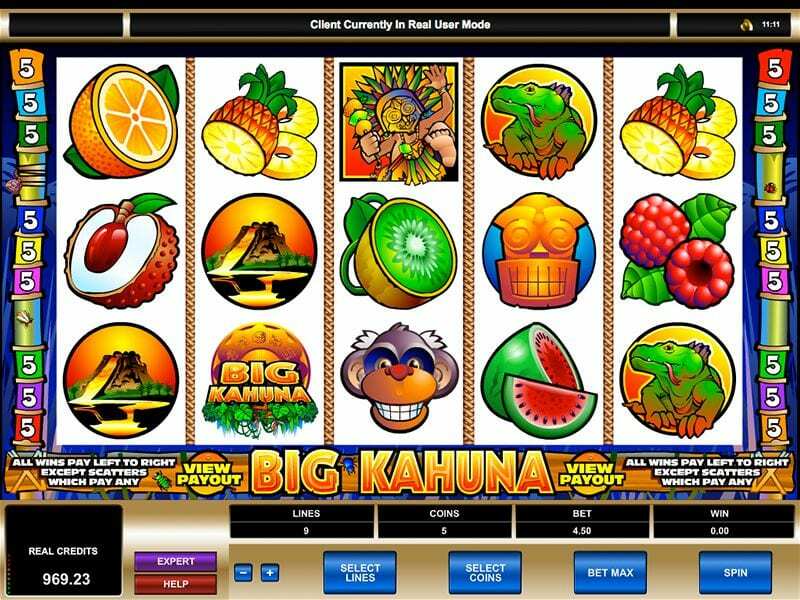 We have liked a lot the experience of playing Big Kahuna online slots game from Microgaming and we are sure you will do so but don’t get our words for granted. Get yourself spinning and winning with Big Kahuna, in the beautiful land of Hawaii!